Long-term solar energy storage; singlet fission solar; improving perovskite longevity. Researchers from Chalmers University of Technology and Universidad de La Rioja created a system capable of storing solar energy for extended periods of time. The system, called Molecular Solar Thermal Energy Storage (MOST), hinges on a molecular photoswitch made from carbon, hydrogen and nitrogen. When the molecule is hit by sunlight, it turns into an energy-rich isomer. The isomer can be stored in a liquid form to be used for heating at night or in winter. The system uses a solar thermal collector, a concave reflector with a pipe in the center. It tracks the sun’s path across the sky, focusing the sun’s rays to a point where the liquid leads through the pipe, turning it into the isomer. The liquid is then is stored at room temperature, leading to minimal energy losses. A catalyst controls the release of the stored energy, acting as a filter through which the liquid flows. The reaction can warm the liquid by 63 degrees Celsius. At the same time, it returns the molecule to its original form, so that it can be then reused in the warming system. “The energy in this isomer can now be stored for up to 18 years. And when we come to extract the energy and use it, we get a warmth increase which is greater than we dared hope for,” said Kasper Moth-Poulsen, Professor at Chalmers. The team sees potential for the technology in domestic heating systems and water heating as well as industrial process heating and in thermal power processes. They are still working on integrating the system, and believe that more energy could be extracted. The research group is aiming for a temperature increase of at least 110 degrees Celsius and thinks the technology could be in commercial use within 10 years. Researchers at Helmholtz-Zentrum Berlin and the University of New South Wales propose a way to beat the theoretical limit for energy conversion of solar cells by taking advantage of a quantum mechanical process known as singlet exciton fission. Singlet exciton fission uses certain organic crystals, in this case tetracene crystals, to split green and blue photons such that they can be used to generate two pairs of charge carrier simultaneously. Additionally, the charge carrier pairs need all their spins to be parallel, creating triplet excitons. Triplet excitons are bound together strongly, making it difficult to split apart them at an interface to silicon and allow them to contribute to the solar cell’s current. For the solar cell, the team integrated a 100 nanometer thick layer of singlet fission-capable tetracene crystals into the surface of a silicon solar cell. Using spectroscopic investigations, triplet charge carrier pairs in the thin tetracene layer were detected, a signature of singlet fission. “The challenge was to separate the triplet pairs at the silicon interface without significantly disrupting the current flow of the silicon solar cell,” explained Klaus Lips, head of the Energy Materials In-Situ Laboratory Berlin at HZB. This was achieved with the addition of an organic conductor called PEDOT:PSS. “With implementing this concept successfully, we can make a silicon solar cell with a maximum quantum efficiency of 200 percent (double the normal limit), and a theoretical efficiency limit of around 40 percent,” said Rowan MacQueen, a physical chemist at HZB. Scientists at the Okinawa Institute of Science and Technology Graduate University (OIST) and Shaanxi Normal University developed a new method for creating perovskite solar cells with an efficiency comparable to crystalline silicon cells but at potentially a much lower cost. A major stumbling block for perovskite cells has been their lack of longevity. For this cell, the team found that making the perovskite layer 1 micron thick increased the working life of the solar cell significantly. 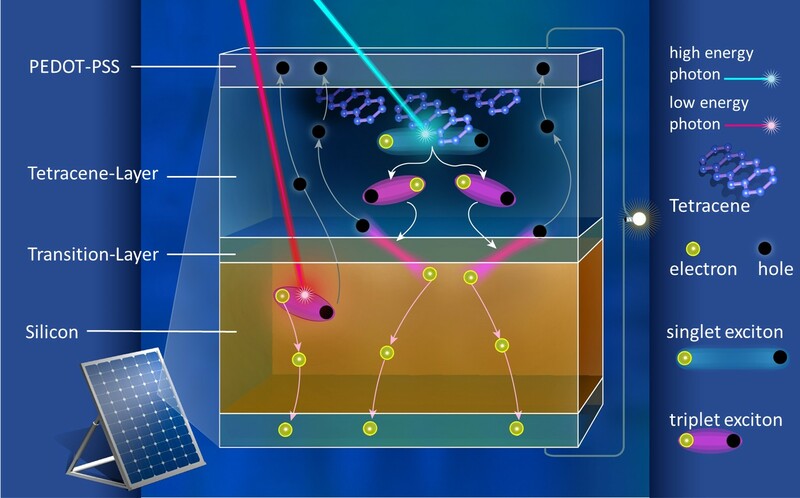 “The solar cells are almost unchanged after working for 800 hours,” said Zonghao Liu, a postdoctoral scholar at OIST. The thicker coating also facilitated the fabrication processes, lowering production costs. “The thicker absorber layer ensures good reproducibility of solar cell fabrication, which is a key advantage for mass manufacturing in the realistic industrial-scale setting,” said. Liu. The team is working to increase the size from the 0.1mm2 prototype to large commercial-sized panels. So far, they have built a working model of the new perovskite solar modules consisting of multiple solar cells on 5cm × 5cm substrates, with an active area of 12cm2, albeit with an efficiency reduction from 20% to 15%. Still, the researchers see commercialization of the technology on the horizon.